This report provides data from 1998, 1999, 2000, and 2001 pertaining to the performance of each of the 50 States, the District of Columbia, and Puerto Rico on 7 national child welfare outcomes developed by the Department of Health and Human Services, Administration for Children and Families, in consultation with State and local child welfare agency administrators, child welfare experts, and child advocates. 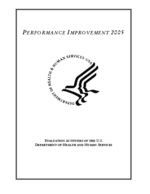 This report is the fourth in a series of annual reports from the U.S. Department of Health and Human Services prepared in accordance with the requirements of section 479(A) of the Social Security Act. The outcomes are: (1) reduced recurrence of child abuse and/or neglect, (2) reduced incidence of child abuse and/or neglect in foster care, (3) increased permanency for children in foster care, (4) reduced time in foster care to reunification without increasing re-entry, (5) reduced time in foster care to adoption, (6) increased placement stability, and (7) reduced placements of young children in group homes or institutions. The report also presents general context information relevant to each State’s child welfare system including the following: (A) the number and characteristics of child maltreatment victims; (B) the number and characteristics of children in foster care and children exiting foster care; (C) the number and characteristics of children “waiting for adoption;” and (D) the number and characteristics of children for whom an adoption was finalized during a given fiscal year. The data presented in the report are from the Adoption and Foster Care Analysis and Reporting System and the National Child Abuse and Neglect Data System. Finally, the report provides cross-State analyses of performance on national outcomes. Key concerns identified in the cross-State analyses are the following: (1) In many States, substantial percentages of children who enter foster care at age 13 or older and children who have a diagnosed disability are not exiting foster care to a permanent home. (2) Many States with a relatively high percentage of children reunified within 12 months of entry into foster care also have a relatively high percentage of children entering foster care who are re-entering within 12 months of a prior episode. (3) In most States, the majority of children who exit foster care to adoption have been in foster care for more than 2 years.